The burning of the roof off of the Cathedral of Notre Dame de Paris seems like only the latest sign that the world around us is coming undone. Perhaps that's why it seemed fitting for Fiona Shaw to show up in Madison Square Park last week to recite T.S. Eliot's bleak poem The Waste Land. Saturday morning I was at a meeting of the 36th Street Writers Block, when Jessica Vera told me about Shaw's imminent appearance. She had recited the poem the previous day, no doubt to the surprise of people randomly walking through the park, and was scheduled to appear again at 6:00 without much publicity fanfare. Of course, I had to come. Eliot's poem, which he acknowledged to be indebted to Jessie Weston's book From Ritual to Romance, deals with the spiritual waste land created by the First World War. As recited by Shaw in and around the empty fountain at the north end of the park, it became supremely relevant, "mixing / Memory and desire" as it were. Though "Winter kept us warm, covering / Earth in forgetful snow," it was time for us to wake up again. Yikes. And all of that is recalled by Tiresias, who has "foresuffered all" and sees the same scene enacted on Philomel repeated again and again and again, down to the present day. That evening, as it so happened, I had tickets to see Lucas Hnath's new play Hillary and Clinton, which interestingly enough also deals with the idea of the same events being enacted over and over. Laurie Metcalf plays someone who happens to be named Hillary Clinton, and who happens to be married to someone named Bill Clinton, played by John Lithgow. The fact that the actors don't really look like their characters' namesakes is part of the point. The details may be different, but the essence is the same. As was the case with his previous play, A Doll's House, Part 2, Hnath doesn't come up with any speculations that couldn't have been dreamed up by anyone else. The speculations are not the point. Rather, we're watching skilled performances of actors re-trodding well-known material with slight but interesting variations. Word on the street is that the production of King Lear with Glenda Jackson pulls off the same trick. I haven't seen it yet, but have my ticket for later this month. Yes, April is shaping up to be just as grim as Eliot's poem claims. Next month, on the other hand, seems to be looking up, but that will be the subject of another blog post. This afternoon, I saw Taylor Mac's new play Gary: A Sequel to Titus Andronicus. If you haven't seen it yet, oh yes, there will be camp. Not that there was ever any doubt. Mac's plays are filled with high camp, and with a cast including Nathan Lane, Kristine Nielsen, and Julie White, we know we're in for some shockingly comedic performances. Titus Andronicus is the bloodiest tragedy William Shakespeare ever wrote, and taking a cue from Tom Stoppard's Rosencrantz and Guildenstern are Dead, Mac takes a minor victim in Shakespeare's slaughter and builds an entirely new play around him. That character is the clown, a term that in Shakespeare's day generally referred to a foolish rustic person, not necessarily to a white-faced entertainer. In Titus Andronicus the clown comes in with a basket of pigeons, and Titus asks him if there are any tidings from the god Jupiter. After a few jokes, Titus convinces the clown to carry a message to the emperor, and wraps a knife in the letter. Of course, delivering a letter with a knife in it isn't the most polite thing to do, and the emperor orders the clown hanged. In Mac's version, however, the clown (whose name we learn is Gary) escapes and gets a job as a maid, cleaning up the mess after the latest blood-filled coup. Santo Loquasto's set design features mounds of bodies and body parts, which Gary and his fellow maid are tasked with tidying up a bit. Body humor abounds, but the play isn't just after laughs. By implication, Mac asks us to consider our responses to all mass slaughters and political disasters, including increasingly frequent school shootings and a failure of allegedly democratic systems to prevent the rise of tyrants. Director George C. Wolfe keeps the tastelessness classy, and Danny Elfman provides a wickedly dark score. If you're interested in learning more, check out the show's website. 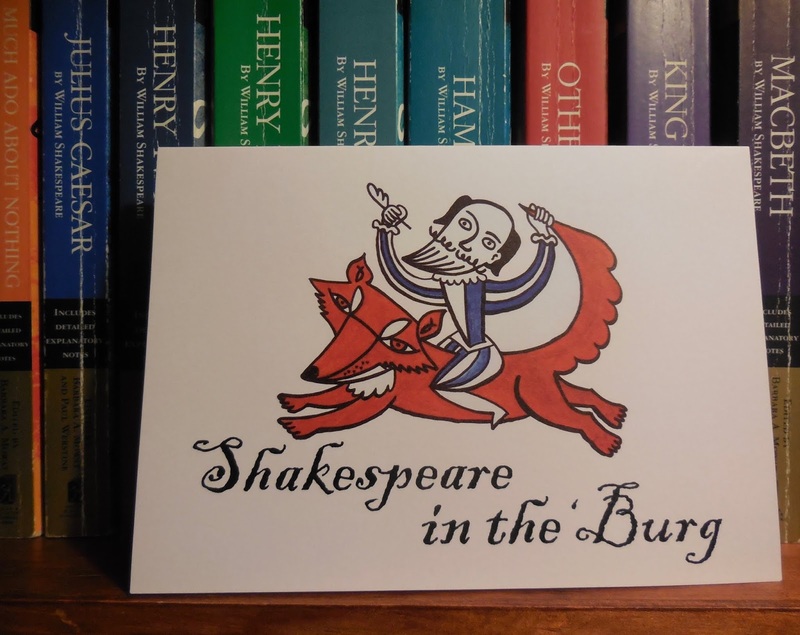 As I previously wrote, my one-act play The Love Songs of Brooklynites won a playwriting competition by Shakespeare in the 'Burg in Middleburg, Virginia and will be having a reading there this weekend. The reading is tomorrow, Sunday, April 7th, at The Hill School. Actors will present staged readings of my play and the plays of two other winners while the audience enjoys brunch. The event begins at 11:00 am and costs $35. You can get tickets here. 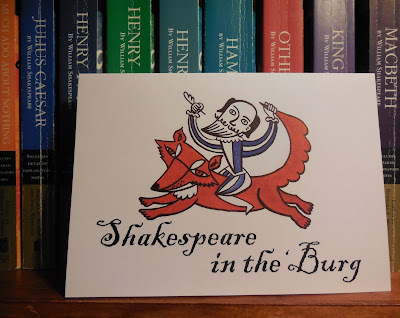 Shakespeare in the 'Burg (as you might suspect) mainly does productions of plays by William Shakespeare. Their current production, Twelfth Night, had two performances earlier today. They sent me the prize today in a lovely notecard. I took a picture of it, which is posted below! I just saw The Public Theater's delightful mobile production of William Shakespeare's The Tempest, which is currently touring all five boroughs. The Public Mobile Unit is bringing the show to St. Paul's Chapel in lower Manhattan tomorrow, then next week they will be in Brooklyn and the Bronx. Subsequent performances include the Queens Public Library and the Faber Park Recreation Center on Staten Island. You can get the full schedule here. Myra Lucretia Taylor gives an emotional performance as Prospero, the wronged Duke of Milan. She was particularly able to shine in her scenes with Sam Morales, who plays her daughter Miranda. Because a cast of only nine performs the whole play, there is some creative doubling, which is often quite effective, as when Dan Domingues plays both the usurper Antonio and the would-be usurper Stephano. Laurie Woolery directs the show with no intermission, providing judicious cuts so that the whole thing comes in at around 90 minutes. If you miss it while it's on the road, you'll get a chance to see it back at the Public beginning April 29th. While Expressionism was being born in Austria and Germany, a very different non-realistic style was getting started in Italy. In 1909, the same year Oskar Kokoschka premiered Murderer, Hope of Women, the Italian poet and playwright Filippo Tommaso Marinetti published a manifesto for a new movement he called Futurism. "We wish to sing of the love of danger, the habit of energy and audacity," Marinetti wrote, adding: "There is not beauty except in strife." Indeed, Futurism embraced violence and warfare, along with anything that could be considered modern: airplanes, motorcars, radios, bombs, and machine guns. Anyone who failed to revere the modern they considered passé and condemned as a "passatista," a term they used to ridicule old-fashioned critics and artists who did not agree with them. The Futurists made bold claims that libraries and museums should be destroyed to make way for new, modern art forms. Though they might never have wanted to actually destroy Italy's artistic heritage, they claimed this as a goal in order to provoke outrage and controversy. The Futurists would read aloud manifestos by Marinetti and others in theatres, and then celebrate when audiences pelted them with vegetables. Controversy was exactly what they wanted, and on at least one occasion the Futurist performers hurled the vegetables the audience had thrown right back at them. Marinetti would also insult audiences to their faces, for instance telling them that it would take a microscope to see their souls. Artists carried Futurist paintings onstage to exhibit them, and actors engaged in outrageous behavior just to provoke a response. In 1913, Marinetti wrote a manifesto that dealt specifically with theatre. He called for a new type of drama that like the performances in variety theatres did not have to mean anything. The performance would be valued as a thing in and of itself, rather than creating an illusion of another world. He railed against the erection of an imaginary fourth wall and called for the performer and audience to relate directly to one another. He also called for the integration of film and other modern technologies into theatrical performance. Like Expressionism, Futurism attracted figures interested in both drama and material arts like painting and sculpture. Umberto Boccioni, for instance, is mostly known today as a painter and sculptor, but he also wrote a number of short Futurist dramas known as "sintesi," or synthetic works. These were meant to be performed in rapid succession, shocking the audience out of their complacency. Boccioni's plays could deal frankly with sexuality, as was the case with Bachelor Apartment, make fun of critics, as with Genius and Culture, or sometimes be entirely surreal, as in The Body That Ascends. 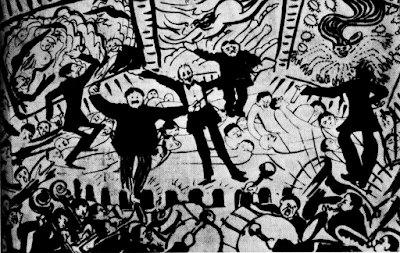 When Italy entered the First World War, both Marinetti and Boccioni volunteered to fight. Boccioni was tragically killed during the war. Marinetti survived it, and after the war was over, started his own political party, which later merged with the Fascist party of Benito Mussolini. Though the Fascists and Futurists later turned on one another, Futurism's relationship with totalitarianism ultimately sullied the movement's reputation. In William Shakespeare's The First Part of Henry IV there is a curious line in the second scene where Prince Hal calls Falstaff "my old lad of the castle." Falstaff is of course an old man who still acts like he's young, so calling him an "old lad" makes sense. Also, there was apparently a brothel in Shakespeare's day that was known as "The Castle," and given what we know about Falstaff, the old knight was likely a frequent visitor. There is probably something else going on here, too, though. One of the big influences on Shakespeare's history plays was an anonymous drama called The Famous Victories of Henry the Fifth. In that play is a character named Sir John Old-castle, often called Jockey, who appears to have been the inspiration for Falstaff. Why then, isn't Sir John Falstaff just called Sir John Oldcastle? Well, in all likelihood, he originally was. The historical Oldcastle, also known as Lord Cobham, really did know Prince Hal, and fought for his father, Henry IV. Once Hal became Henry V, he protected Oldcastle, whose heretical views landed him on the wrong side of the Catholic Church. Eventually, however, even the king had trouble protecting Lord Cobham. Henry V had him imprisoned in the Tower of London, but he escaped. The historical Sir John Oldcastle then turned on the king and led a rebellion against him, hoping to have himself set up as regent and rule in his place. The rebellion was suppressed, but Oldcastle escaped and remained a fugitive for many years. When Sir John Oldcastle was at last apprehended, he was tried, convicted, and sentenced to death. According to Holinshed's Chronicles of England, Scotland, and Ireland--a source Shakespeare seems to have frequently consulted in writing his history plays--Oldcastle was "hanged in a chain by the middle, and after consumed with fire, the gallows and all. Knowing that makes all of the references to hanging and burning in the Henry IV plays take on greater resonance. Why, then, did Shakespeare change the name? While Oldcastle was deemed a heretic in his own day, by Shakespeare's time many regarded him as a martyr. That's certainly how he is portrayed by John Foxe in his pro-Protestant propaganda Acts and Monuments, generally known as The Book of Martyrs. Foxe goes as far as to compare Oldcastle with Christ, and calls him "this valeaunte Christen Knighte, syr Ihon Oldcastel," which is certainly not how we think of Falstaff. The present-day Lord Cobham and his family must not have liked having their illustrious ancestor portrayed as a drunkard and leacher who robbed travelers and pretended to be dead to escape having to fight. By the time Shakespeare's play was published in a quarto edition in 1598, the name had been changed to Falstaff. Why Falstaff? Well, Shakespeare had already made fun of another historical figure, Sir John Fastolfe, in The First Part of Henry VI, portraying him as a coward. If the fictional Sir John got confused with that other historical figure, it would be no big deal. One word more, I beseech you: if you be not too much cloyed with fat meat, our humble author will continue the story, with Sir John in it, and make you merry with fair Katherine of France, where, for anything I know, Falstaff shall die of a sweat, unless already he be killed with your hard opinions; for Oldcastle died a martyr, and this is not the man. As it happens, Shakespeare did not bring Falstaff back in Henry V, but he does recount his offstage death in that play. The epilogue's claim that "this is not the man" could be a final reminder that Sir John Falstaff is a creation of fiction, and should not be interpreted as anything else. Last night I saw the Mabou Mines production of Faust 2.0 at 122 Community Center, formerly known as P.S. 122. P.S. 122 first became a performance space in 1980, taking over the former home of Public School 122. It was always a dirty, dingy building where you could see magnificent theatre. I remember catching a great production of Bertolt Brecht's Saint Joan of the Stockyards there with a huge cast of young, fully committed actors. A few years ago, the whole building was shut down to be extensively remodeled. Last night, I walked into the box office, which is now around the side of the building and fully handicapped accessible, rather than up the steep steps I remembered from before the renovation. The place was so... clean! Not a speck of dust or dirt to be seen. The second part of Goethe's Faust is a notoriously difficult text, but this adaptation by Matthew Maguire ambitiously tries to pack as much of it into a brief time span as it can. The first scenes in the show are actually from the first part of Faust, where Mephistopheles makes a bet with God and then forms his pact with the melancholy Doctor Faust. In German, the phrase that is supposed to bring about Faust's damnation is "Verweile doch, du bist so schön!" Literally it means "Stay there! You are so beautiful!" Maguire renders this as something like, "Stop, linger there a while." It might not be the most exact translation, but it captures the spirit, and is better than Walter Kaufmann's overly poetic "Abide, you are so fair" which has become something of a standard version. After setting up the situation, Faust 2.0 launches into the second part of Goethe's massive dramatic poem. The first act of Faust Part Two deals with Faust and the Emperor, who is of course the Holy Roman Emperor of a Christian Europe, but in the Mabou Mines production, director Sharon Ann Fogarty portrays him as a classical ruler of the Roman Empire. He is played campily by Greg Mehrten, who appears on video screen. Most of the cast, in fact, appears only on screen, lending the production an air of artificiality that corresponds with the self-consciousness of the second part of Goethe's epic drama. Faust 2.0 basically skips over the second act of Goethe, eliminating the Homunculus and the classically inspired Walpurgisnacht. Instead, we go to the magnificent third act where Faust brings back Helen of Troy, played here by Angelina Impellizzeri. She and Faust have a son, Euphorion, played by 7th grader Oliver Medlin. Goethe probably meant Euphorion to be based upon Lord Byron, whose youthful spirit flamed out in an early death, and the boy's destruction weighs heavily on his parents. Helen sinks down into Hades, and Faust (played rather feelingly in this moment by Benton Greene) becomes distraught. After the death of his son, Faust turns to war, aiding the emperor in a battle against his rival, and then in the final act to attempting to improve the world by driving back the sea. At last achieving something he deems worth doing, Faust utters the forbidden phrase and dies. Paul Kandel, who plays Mephistopheles, is wonderful as he gloats over the fallen Faust, but he doesn't have the last laugh, as readers of Goethe know. It isn't every day you get to see a production of Faust Part Two, so if you're interested in this modern reimagining, be sure to get your tickets.